The City of Vernon’s backdrop is one of its main assets. Vernon is situated at the north end of the Okanagan Valley, striking mountain views frame three scenic lakes. From spring’s bright and colourful wildflowers, to autumn’s yellow stands of cottonwood and aspen; you could have a front row seat to all four seasons, from the comfort of your own property, with our Vernon Window Cleaning Service. Whether it’s time for the annual comprehensive clean or perhaps you’re putting your home or business on the market; sparkling, streak-free windows make a huge difference. You’ll be surprised and delighted with the meticulous job our Gorillas are capable of, even with those giant hairy hands! 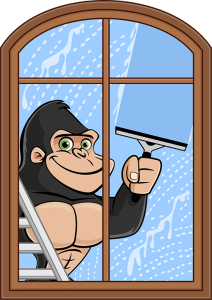 Gorillas leave no streaks of drips for your Vernon Window Cleaning. Since services are carried out by hand (or paw? ), you get a full clean from top to bottom and into every corner. However, it’s our attention to detail that sets us apart from the competition. Gorillas check every sill, wiping them clean. We’re happy to wash the whole frame too. All you have to do is ask! We’re your one-stop-shop for residential and commercial Vernon Window Cleaning, inside and out, at three storeys and below. Our trained and certified Gorilla technicians arrive fully stocked. They use pure rubber squeegees to prevent static build-up, meaning your windows stay cleaner for longer. Gorillas suggest window washing twice a year for maintenance. All cleaning solutions are earth-friendly and biodegradable. Each ‘Gorilla Mobile’ is outfitted with, not just a bucket truck but, tucker poles (a long pole with a brush on the end and water running through it). This makes cleaning skylights, roof glass and awnings a breeze.